They waddle feebly into the verification room, haggard and pale, longing for something to put into their stomachs. Their eyes are drowsy, feet all covered in dust. For the last seven days, 27-year-old Maneno Rose has been on the road, trekking helplessly with her 3 little children from South Sudan. Jonas Ladu 10, Joel Anduga 9 and Betty Poni 3 are all frozen with hunger as they approach the World Vision desk to receive two packs of high energy biscuits each. This will be the family’s very first meal in Uganda. 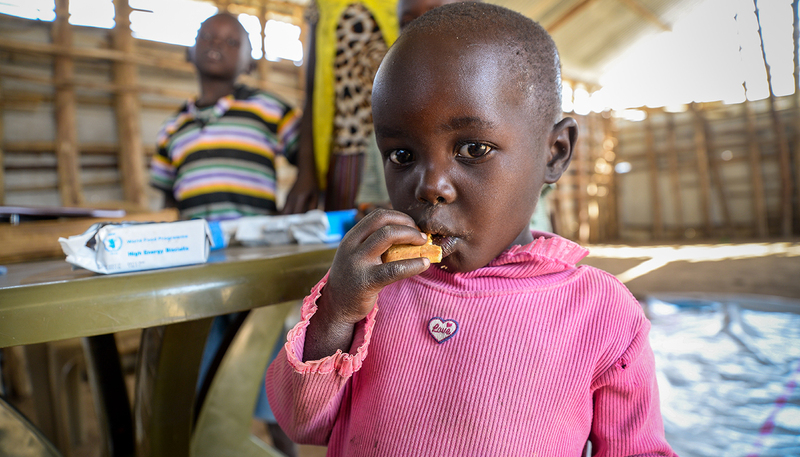 World Vision staff, Masumba Rahima helps 3-year-old Betty Poni unpack her biscuits. The other 2 children and their mother ferociously tear the packs and pounce on the contents inside. After consuming her fourth biscuit, Rose finally manages to talk. ‘’I don’t know where my husband is. He was not home when we were attacked. I just picked the kids and we ran out.’’ Rose explained in a sunken voice. She eats some more biscuits, beseeching her children to do the same. ‘’We’ve been eating raw cassava tubers from people’s gardens along the way. That’s all we could find. For water, we took from open streams along the way. We drank any kind of water we found because the children would get so thirsty.” Rose adds. Rose says sometimes the family could walk for a whole day without finding any gardens where to uproot raw cassava. On such occasions, the children would refuse to walk again. ‘’I would keep promising them that we are finding a garden very soon. But there were not many gardens left with cassava tubers. People ahead of us had cleared much of it. The children would cry and complain about hunger and pain in their legs. Betty would ask me to carry her on my back but I couldn’t. We would sometimes spend two days resting in the bush. It was not safe sleeping along the road so we avoided it,” Rose adds. Rose’s first born, 10-year-old Jonas Ladu immediately assumed responsibility over his two siblings. His mother says while on the way he would not eat until he was sure there was enough for all three of them. This same trait was witnessed as the children received high-energy biscuits from World Vision. Jonas came third. World Vision partners with the World Food Programme to distribute these wonder biscuits at four border posts. After eating half a pack each, the children’s faces begin to ease. Little Poni can be seen attempting to feed her elder brother Joel from her mother’s laps. Their mother is surprised that for the first time in over four days, the three children are playing with each other. ‘’They were not talking at all. They were so hungry and very tired,” Rose says. Poni signals her mother for more biscuits, which had by now been kept away in the family’s only polythene bag. 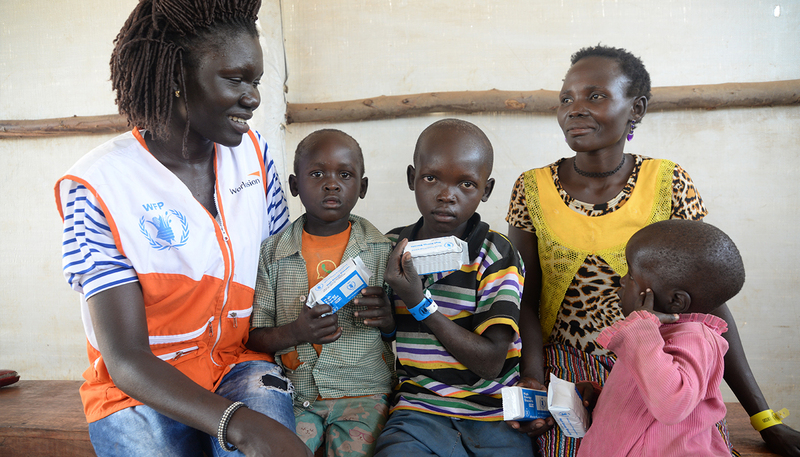 Rahima the World Vision staffer giving biscuits to all new arrivals at Goboro border post is not surprised that the three children have revived in a just short while. Three-year-old Betty Poni eating high energy biscuits. ‘’I see this almost every single day. Hundreds of refugees come in looking very sick and frail. But once we give them these high energy biscuits plus water, they quickly change. All of a sudden the children begin to run around, to play, and they respond to questions. Before they eat these biscuits, it’s even hard to interview them or pick their details. These biscuits have some glucose that rapidly replenishes their energy. They are not the ordinary biscuits,” explains Rahima, a World Vision distribution assistant. According to the World Food Programme, high energy biscuits are wheat-based biscuits that provide 450 calories with a minimum of 10 grams and max of 15 grams of protein per 100 grams, fortified in vitamin and minerals. They are always given in the first days of emergency when cooking facilities are scarce. The biscuits are blended with wheat flour, hydrogenate vegetable shortening, sugar, soy flour, invert syrup, high fructose, corn syrup, skimmed milk powder, sodium and ammonium, bicarbonates, salt, minerals and vitamins. But World Vision is not only giving biscuits to new arrivals. The organisation is also providing hot meals to new arrivals. The meals comprise of beans, maize meal and porridge. It’s the very first hot meal refugees like Rose and her 3 children are having after seven days of wandering. And no sooner had the food been served than the four rapidly washed their hands and dived into their plates. For the next ten 10 minutes no one was talking, the sound of enthusiastic fingers plunging into the bean soup reverberated. 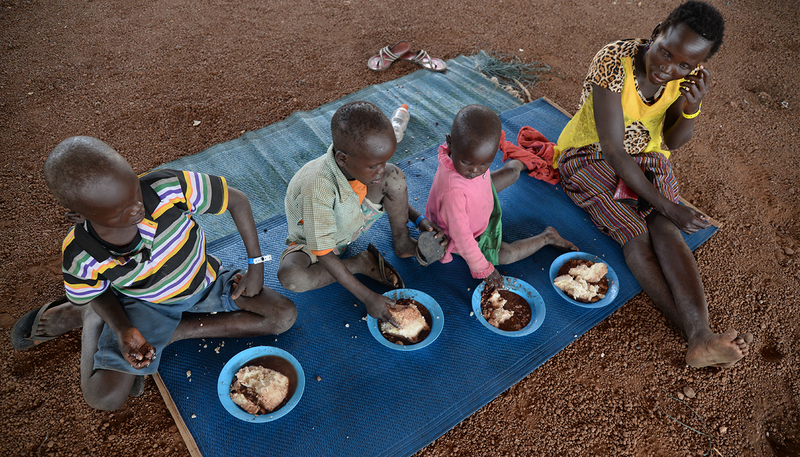 Rose and her children eat a hot meal provided by World Vision inside one of the temporary over-night shelters at Goboro refugee transit centre. This is their first real meal in weeks. ‘’Tonight we will sleep very well, we have not eaten like this in a very long time,” Rose says after eating. Later, Jonas draws something he misses the most about South Sudan. After five minutes, he has created a grass thatched hut on the paper. ‘’That was our house. My clothes are there,” Jonas explains and then keeps quiet again. He’s a young lad of few but very calculative words. Because of continued insurgence, Jonas and his sibling Joel have been out of school for now two years. Rose is hopeful that they will enrol for school in Uganda. Jonas loves aeroplanes and his mother tells me he wants to fly one someday. For now, the family is out of danger. Sadly their throbbing voyage as refugees has just begun. The reality will hit once they receive their plot of land and commence to restart living in new home here.